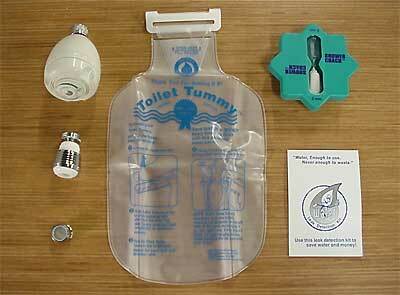 Toilet water use can be cut by 40% with a displacement bag (toilet tummy). Faucet water use can be cut by 50% with a low-flow faucet aerator. Shower water use can be cut by 50% with a low-flow showerhead. 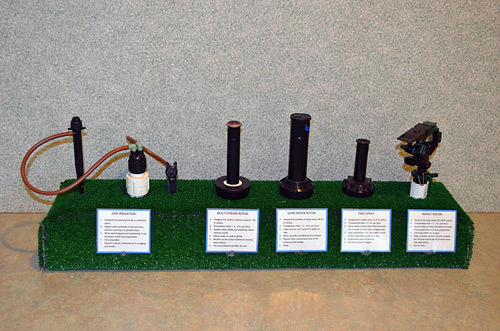 The District provides its customers free water efficiency tools to reduce water waste. Check for indoor leaks! The largest indoor water inefficiency can be a leaky toilet, a leaky faucet or a high-flow showerhead. Indoor leaks can lead to a lot of water waste and should be repaired immediately. A faucet that leaks 60 drops per minute can waste 200 gallons of water each month. If you aren’t using a low-flow showerhead you could be using 80 gallons of water for every 10-minute shower rather than 25 gallons with a low-flow showerhead. Fixing a silent toilet leak can save up to 50 gallons of water per day. Click here for a great water saving tool. Save Water, Money and Energy Now! A majority of your water use and water waste occurs outdoors, especially during the hot summer months. That’s why being water efficient is especially important this time of year.Carmichael Water District, SMUD and other Regional Water Authority water providers are urging customers to water outdoors only between midnight and 10:00a.m., and avoid the peak demand times of 5 to 8 a.m. Scheduling your sprinkling times during these time periods helps two ways: you increase your water efficiency by reducing water loss through evaporation and you help save energy by putting less strain on the power grid during peak demand times. Before you begin your next irrigation/gardening project, pick up a brochure titled “Easy Water-Wise Gardening” or “Water Efficient Landscapes” at the District office. In it you will find helpful tips and resources. Are you using more water than you thought? Take a look at your bill. The average daily water use in our District is approximately 822 gallons per household per day. You’d be surprised at how much water you are using and money you can save by following conservation tips. Today, water conservation has many meanings. It means storing, saving, reducing or recycling water. Drip irrigation is the most efficient method of watering for non-turf areas such as bedded plants, trees or shrubs. Drip systems minimize or eliminate evaporation, impede weed growth and may help prevent grass diseases caused by under or over watering. Soaker hoses are an inexpensive alternative to drip irrigation. Soil moisture should be monitored to determine when enough water has been applied. In-ground irrigation systems can be automatic, manual or a combination. The automatic system can provide an efficient method of irrigating lawns because controllers turn the system off after a predetermined amount of time so a measured amount of water is applied. Check timing devices regularly to make sure they are operating properly. Watch for broken or misdirected sprinklers. If using a hose and sprinkler, place the sprinkler in the area that is driest. Allow the sprinkler to run the proper length of time and adjust the hose and sprinkler until it waters just the grass or shrubs, not paved areas. Designed for watering shrubs or individual plants. Applies water precisely to desired areas without watering non growth areas. When well designed and maintained, it can eliminate runoff and evaporation. Requires regular maintenance for clogging and breaks. Designed for small to medium areas (4 – 30 ft radius). Precipitation Rate = .3 – .5 in. per hour. Applies water slowly and uniformly, which reduces runoff. Allows water to soak in gently. Nozzles can be easily installed on existing spray system. The most efficient sprinkler for turf. Designed for medium to large areas (18-55 ft radius). Precipitation Rate = .2 – .8 in. per hour. Lower precipitation rate is good for slopes or clay. More versatile and efficient than impact. Require little maintenance due to the enclosed body design. Designed for smaller areas (3-15 ft radius). Precipitation Rate = 1 – 2 in. per hour. Impact action creates mist which increases the amount of water lost to evaporation. Brass or bronze models are very durable, but they do require regular maintenance and adjustments. Designed for large areas (20-150 ft radius). Remember to change your irrigation timer seasonally! Watering (3) days a week should be sufficient for a typical landscape. Keep in mind that watering at the right time of day can save water, energy and money. A majority of your water use – and water waste – occurs outdoors, especially during the hot summer months. That’s why being water efficient is especially important this time of year. The District is urging customers to water outdoors only between midnight and 10 a.m. and to avoid the peak demand times of 5 to 8 a.m. Scheduling your sprinkling times during these periods helps two ways: you increase your water efficiency by reducing water loss through evaporation and you help save energy by putting less strain on the power grid during peak demand times. Each year, the district spends more than $1 million on electricity for operating the water treatment plant and other district facilities and distributing water to customers. By practicing water efficiency, customers can help reduce the amount of electricity required for distribution. Please remember that the district’s costs for electricity are directly related to water usage within the district. The higher the water usage – the higher the electricity usage and resulting energy costs. Using water efficiently saves both water and energy. Wrap all pipes! You may purchase special wrapping material or simply use an old sweatshirt or newspapers. Secure them with plastic tape. Know where your main shut off is located! Disconnect all hoses, and then wrap all faucets to prevent them from freezing. Inspect your water meter! The meter will be safe from freezing if the dead air space is maintained around it. Traveling during the winter? Ask a friend to check your premise while you are away. Let them know that it’s OK to call Carmichael Water District for assistance if the need arises. If your pipes do freeze, wrapping them with rags and repeatedly pouring warm water over the rags may thaw them. Once pipes thaw, rewrap them with dry materials. Without a cover, an average pool (18 feet x 36 feet) loses about 1 inch of water per week in the peak of summer. This can add up to an annual water loss of 7,000 gallons of water. Algae or other water quality problems can occur when a leak prevents the water level and chemistry from staying constant. Loose tiles or cracks in the pool deck. Cracks and gaps in the bond beam or water-saturated soils in the area around the pool, pumps or plumbing. Use a grease pencil to mark the water level of the pool at the skimmer. Check the mark 24 hours later. Your pool should loose no more than ¼ inch per day. Otherwise, a leak is indicated. Place a 5 gallon bucket filled with pool water on a pool step (the level in the bucket should be even with the pool level). Mark the level of the water in the bucket and on the side of the pool. After 24 hours if there is a greater drop in the pool level than in the bucket, a leak in the pool is indicated. If the water level settles at the light, the leak is probably there. If the water drops below the light, then there may be a leak in the drain at the bottom of the pool. Due to their ease in maintenance cartridge filters are a good alternative to diatomaceous earth or sand filters that typically use up to 500 gallons of water per backwash.